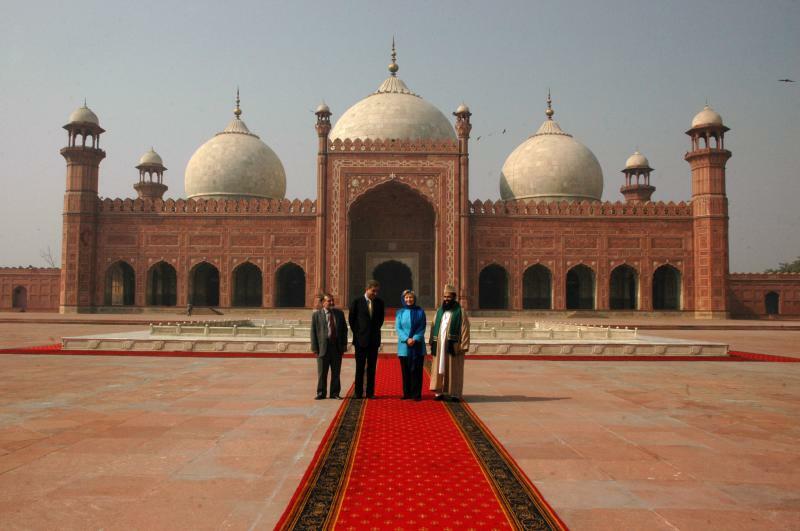 Secretary of State Hillary Rodham Clinton arrived here Sunday for high-level deliberations with Pakistani leaders, the latest in a series of encounters that the Obama administration hopes will chip away at decades of suspicion between Pakistan and the United States. Hillary Rodham ClintonMrs. Clinton will announce a raft of initiatives to help Pakistan in public health, water distribution and agriculture, to be funded by $500 million in American economic aid. Among other things, the United States will build a 60-bed hospital in Karachi and help farmers export their mangoes. Yet these projects, however beneficial to this economically fragile country, do not disguise several nagging sources of friction between the two sides. American officials still question Pakistan’s commitment to root out Taliban insurgents in its frontier areas, its motives in reaching out to war-torn Afghanistan and its determination to expand its own nuclear program. Pakistan plans to buy two nuclear reactors from China — a deal that alarms the United States because it is cloaked in secrecy and is being conducted outside the global nonproliferation regime. Administration officials said they did not know if Mrs. Clinton planned to raise the purchase. Relations could be further tested if the Obama administration decides to place a major Pakistani insurgent group, the Haqqani network, on the State Department’s list of terrorist organizations. Islamabad maintains ties to the group through its intelligence service, and it is seeking to exploit those connections as a way to extend its influence over Afghanistan. For all that, tensions between the two sides have ebbed since Mrs. Clinton’s last visit here in October, when she was peppered with hostile questions in public meetings and bluntly suggested that people in the Pakistani government know the whereabouts of Osama bin Laden and Mullah Omar. Mr. Holbrooke noted a U-turn in Pakistan’s policy on issuing visas to American diplomats. For months, Pakistani officials had held up those applications, creating a huge backlog and frustrating the United States. But Pakistan issued 450 visas in the last five days, he said. Mr. Holbrooke conceded that public-opinion polls toward the United States had yet to show much of a change. Mrs. Clinton may receive more criticism on Monday at a town-hall meeting in Islamabad. Her visit, which was not announced due to security concerns, is being conducted under tight security. The United States is encouraged by the burgeoning dialogue between President Hamid Karzai of Afghanistan and Pakistani leaders, including the chief of the staff of the army, Gen. Ashfaq Parvez Kayani. Any resolution of the war, Mr. Holbrooke said, must involve Pakistan. While American officials would like to see a more aggressive Pakistani military push in North Waziristan, the stronghold of the Haqqani network, they praise the military’s campaigns in South Waziristan and the Swat Valley, where Taliban insurgents had also made gains. Pakistan’s battle against insurgents has exacted a fearful civilian toll. Last week, a suicide bomber killed 45 people, and injured 175, in an attack on a 1,000-year-old Sufi shrine in Lahore. Many Pakistanis blame the American-led war in Afghanistan for fomenting anti-Pakistan terrorism. A coalition of protest groups issued a statement Sunday, timed to Mrs. Clinton’s arrival, which calls for an end to the war in Afghanistan and for Americans and Pakistanis who are involved in clandestine air strikes on Pakistani targets to be tried for war crimes. Mrs. Clinton is to meet General Kayani on Monday, after meetings on Sunday with President Asif Ali Zardari and Prime Minister Yousaf Raza Gillani. She was also scheduled to meet Pakistani business leaders and the head of the Pakistani opposition, Nawaz Sharif. Mrs. Clinton has brought a shopping-bag full of commitments for Pakistan, drawn from the $7.5 billion in non-military aid, over five years, pledged by Congress last year. The emphasis is on basic services like electricity and water, politically-charged issues in this country, particularly during the hot summer. Administration officials said the project to upgrade Pakistan’s creaky power grid, which involves building hydroelectric dams and rehabilitating power plants, had helped reduce chronic power outages. But on the day Mrs. Clinton landed, television reports here warned of further outages.